Drip, drip, drip. The Tiber is overflowing with leaks from WikiLeaks documents which reveal the relationship between notorious George Soros operatives and high level Vatican prelates. They expose that the enemy scaled the Vatican wall and is now ensconced behind the Bronze Doors of St. Peter’s. The purpose of the Soros/Vatican collaboration was to coordinate the Pope’s U.S. address with the Clinton campaign. Soros sought to align Clinton campaign talking points with the Pope speeches during his U.S. trip. The goal of the PICO grant seeks to reinforce mutual concerns between the Pope and Clinton’s campaign agenda and bootstrap the popular Pope to reinforce the campaign themes of the democratic candidate in hopes to influence the 2016 U.S. Elections. Soros is funding an array of Clinton campaign operations to the tidy sum of $25 million. Soros understands that it is crucial to split and dilute the Catholic vote by using the Pope’s social justice agenda as a proxy for the Democratic platform. What is PICO, the $650,000 grant recipient who will organize activities to engage the Pope on economic and racial justice activities? According to KeyWiki, PICO is “a progressive national network of faith-based organizations". PICO was founded in 1972 by John Baumann, a Jesuit priest trained in Saul Alinsky community organizing in Chicago in the 1960s. Open Society and PICO identify Cardinal Oscar Rodriguez Maradiaga, the highly favored Francis appointee who heads the Pope’s prestigious 9 Cardinal Cabinet. Cardinal Rodriguez serves as the sympathetic and willing conduit to promote their mutual globalist cause. Soros’ people cleverly and accurately identified the most powerful prelate in the Vatican to advance the radical Soros agenda. How cunning! Did the PICO meeting ever happen at the Vatican? Did Soros get his $650,000 worth of pay to play at the Vatican? The details of the PICO Vatican trip were reported in a revealing email to John Podesta, Chairman of the Clinton Presidential Campaign. With the most recent Wikileaks document release of John Podesta’s email, Catholics now know the details of the Soros funded PICO junket to the Vatican. As Francis would say, “The God of Surprises” does not disappoint; The trip was a resounding success! Is this the nature of the inter-faith dialogue that Pope Francis constantly imposes on the Catholic faithful? Francis foists inter-religious dialogue because “Only through dialogue – he says – will we be able to eliminate intolerance and discrimination. Inter-religious dialogue is a necessary condition for world peace.” Tell that to the business owners of Ferguson whose buildings were burned to the ground by BLM anarchists. Based on these emails, the Vatican’s inter-faith dialogue appears to be a radical social justice rant with Soros operatives and union political organizers. Good to know. As the email indicated, the PICO operative raved about “this amazing group.” What did this amazing group discuss while at the Holy See? Did they chat about the massive closures of black Catholic churches in the inner city? Did they discuss the strategic targeting of poor black women by Planned Parenthood for abortions? Did they discuss the tragic disintegration of black families and the soaring out of wedlock black births? Not likely. The purpose of the Vatican trip, and Soros grant laid the groundwork for the presidential campaign. The Soros hacks “dialogued” with the Vatican cardinals about the lofty theology of the politics of race baiting. Clearly PICO, on orders from Soros, urged the Vatican officials to emphasize the democratic talking points of inequality and exclusion during the election cycle of 2016. In other words, let’s ensure we are on the same page so that Hillary Clinton is elected. This Vatican PICO visit was strategically timed to set the stage for the Pope’s U.S. visit to speak about the issues intrinsic to the Democratic Party platform: race and inequality. Soros understands that his democratic flacks must shore up the black voter base by reinforcing racism and voter angst. Who better than the popular and moral leader, Pope Francis to promote their democratic party theme. Not surprisingly, the Vatican reception to the Soros radicals was overwhelmingly warm and effusive. 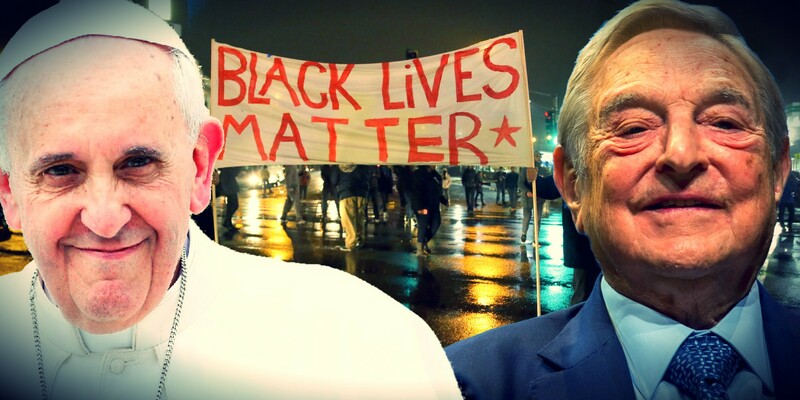 The Pope’s inner circle signaled to the Soros operatives that Francis would address race, apparently through the faux prism of the Ferguson riots and Soros-funded Black Lives Matter riots. According to Cardinal Rodriguez, Pope Francis would lend his moral voice to the political landscape and issues ginned up by George Soros and his Alinsky inspired radicals. Soros money buys world disorder. World disorder creates the breeding ground for a New World Order. As the ancient Chinese military general, Sun Tzu strategized, “in the midst of chaos, there is also opportunity.” Soros understands this demonic dynamic. Accordingly, he puts his billions to work. George Soros provided $33 million in one year to support the grass-roots, on-the-ground race baiting activists in Ferguson, according to the most recent tax filings of his nonprofit Open Society Foundations. The Black Lives Matter activists created chaos and anarchy in Ferguson under a phony trumped up police brutality scenario with Soros millions. Hence, agitate the democratic party base of black voters. The topic of salvation of souls is now replaced in Vatican meetings with the salvation of the Democratic party. Politics of the radical leftists Alinskyites dominate the discussions at the Vatican. Prominent curial Cardinals devote three days to the agenda of George Soros, self declared atheist, the most virulent global promoter of abortion, euthanasia, manufactured chaos, and the New World Order. A New World Order is now entrenched at the Vatican.